Welcome to this month's Constellation Showcase! This monthly segment details a currently viewable constellation, typically somewhere along the ecliptic. This month we're making a departure from the ecliptic and up the Milky Way to bring you this month's Constellation Showcase: Cygnus! Like last month's feature Sagittarius, Cygnus lies within the Milky Way, so it is chock full of targets for your backyard telescope! This time of year (August-September), it is almost directly overhead at 10PM to 12AM local time. This makes it very easy to find. 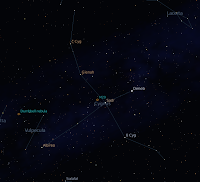 Cygnus is shaped somewhat like a cross, as can be seen in the picture to the right (Courtesy of Stellarium). If you follow the short arms of the cross outward, you will see that they form wing-like appendages. This is where Cygnus the swan gets its namesake. Cygnus is known to most people as a swan, although it is sometimes also called The Northern Cross. The constellation's origin, like many others is placed in Greek mythology. In one such myth, the king Cycnus was related to Phaethon, son of Apollo. Apollo unwittingly allowed Phaethon to take the controls of the sun chariot. Zeus is outraged at this, and sends Phaethon crashing into the river Eridanus. Cycnus desperately tries to retrieve Phaethon from the river, but fails. In diving repeatedly into the river, Cycnus is transformed into the swan we see today. Cygnus is home to quite a few impressive and famous nebulae. One of these, NGC 7000, is commonly known as the North American Nebula. It is called this because of its apparent resemblance to the continent of North America, in modest telescopes. In the picture to the left, you can see the resemblance very well (Image courtesy of Oliver Stein). The North American Nebula is very large. If you were to put it next to the full moon, the moon would be dwarfed! The North American Nebula is about ten times the apparent size of the full moon. The reason you can't see the North American Nebula with your naked eye is that the nebula is very dim, and requires a telescope to gather enough light to see it. No one knows which star(s) are contributing to this emission nebula's glow, but if we assume it is Deneb, we can infer that the nebula is approximately 1800 light years away and 100 light years across. The Pelican Nebula can be seen very near the North American Nebula. Like its nearby neighbor, the Pelican Nebula is thought to be about 1800 light years distant, and is closely associated with its neighbor. One of the most famous nebulae, the Veil Nebula, calls Cygnus home. 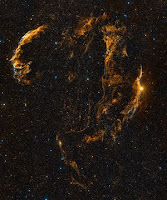 The Veil Nebula, also known as the Cygnus Loop is a beautiful sight, provided you have the equipment to see it. At right, you can see an amazing image of the Veil Nebula taken by the Palomar Observatory (Courtesy of Palomar Observatory/STScI/WikiSky). Of course, the view in a home telescope won't come anywhere near this image, and can actually be quite difficult to see. Using an oxygen-III filter helps significantly in seeing this nebula. This filter only allows light near the oxygen-III emission lines, and works great on the Veil because most of its light is emitted in this spectrum. The nebula itself was formed from the remnants of a massive supernova explosion. It is thought that the original source of the supernova exploded about 5000 years ago. The nebula we see now is a shockwave of sorts, expanding into deep space. Cygnus X-1, which resides in the constellation Cygnus is the one of the strongest known x-ray radiation sources visible from Earth. It is now believed that Cygnus X-1 is indeed a black hole. Cygnus X-1 is composed of a very high-mass binary system, with a star feeding material into the black hole's accretion disk. The most interesting star in Cygnus to look at with a telescope is the binary star β Cygni, also known as Albireo. Albireo is so interesting because of the colors of its component stars. The picture to the left closely approximates the colors visible through most decent telescopes (Courtesy of Hunter Wilson). Even a cheap telescope will show good color between the two stars. Albireo A is the brighter orange star, and Albireo B is the dimmer blue star. The color of the stars is slightly exaggerated by the human eye, due to their close proximity and vast difference in color. This makes Albireo an excellent target for any telescope, and any astronomer (beginner or expert). Sometimes even the view through your finderscope will show significant color in this binary star. Albireo can be located in the diagram of Cygnus seen at the top of this page. Dehradun Escorts continue point and down payment your quantity for that Dehradun call girl Support and in the end this we offer in-call and out-call offer for that individuals plus they need they must have different encounter with this escorts women therefore come and attempt to get the service of Dehradun Escorts Providers. Although the town would offer you the lots of quality Chandigarh vip escorts which would consist of high class escorts from different backgrounds. The existence of issue in plenty is definitely in fact offering wider range but at the same period individuals are locating out the problems in selecting the correct kind of services. Hi, Excellent these records, Well grateful for appropriating such risky regarded. I like your website and I like the prospective and considering doing what should be finished. thank you so much. About game and play we can talk anywhere and anytime. At any age, in any generation there were games. What characterized the game has always been its live character, here and now, face to face. This is how the history of the elastic, the castle, the yolk, the leaf, and other unblocked games of the previous generation were written. A 10-year-old kid responded to her mother, who was terribly annoyed at the energy she puts on the game in the face of the themes: in school, I am somehow, in my game I am the best. My friends in the solitaire game rely on me. So here's a prime advantage of the game, it can become a narcissistic support in the healthy development of self-image. But parents do not usually have an interest in knowing this scenario, but they reproach, are you out there too? Just keep your eyes on the computer mario games, you're going to get sick; do you also put a hand on a book? In his mind, playing is to run, do something with your hands, and so on like playing cool math games also. Fabulous post share keep sharing with us. Amazing post keep sharing with us always. Excellent post thank you for sharing with us. Great article with a lots of great facts. Neelam Nainital is the name of fun that is shelter for daylight darlings. Vacillate lake and imaginative sun waves make consummate blend for guests here. disha oberoi is the name of fun that is shelter for daylight darlings. Vacillate lake and imaginative sun waves make consummate blend for guests here.